The HavanaReviews.com team stayed at Hotel Deauville Havana for one night. 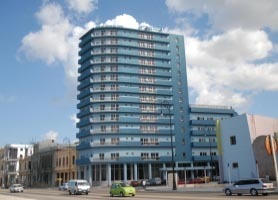 The Hotel Deauville Havana is best considered for its location and extremely low price. Yes, the Deauville is a total bargain for its prime Malecon location, views, swimming pool & overall price; though for aesthetics & luxury you should look elsewhere. East & West it overlooks the wide sweep of the Malecon, Northward is the huge expanse of ocean and the romantic Morro Castle and its famous lighthouse. The South facing rooftop pool terrace has a wide view of Central Havana and the whole City. 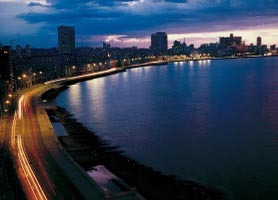 Being on the main Havana Malecón sea front axis it is excellently located for visiting Old Colonial Havana and the more modern Havana areas of Vedado and Miramar. And there is of course plenty to experience on the very popular seafront and backstreets off Galiano & San Lázaro Avenidas. Even though the exterior and rooms of the Deauville Hotel were renovated in 2011 the hotel is a little tired but, again, the price and location is why you´d choose the Hotel Deauville Havana. In 2012 the new hotel manager has introduced live music every night in the lobby bar. On the first floor there is a restaurant called “Costa Norte”, stylishly decorated with tables facing the sea. Hotel Deauville was formerly known as Hotel BelleVue Deauville and Hotel Hotetur Deauville but is now under the management of a Spanish hotel chain who’ve made the hotel sparkle. Hotel DEAUVILLE Havana is one of the few hotels that does not require prepayment or deposit to Book. 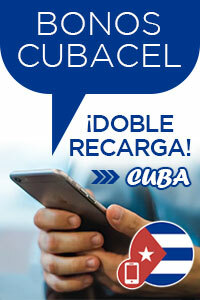 Chat * Cuba Travel Help?